OK, so today I've had a couple of groups who has been learning math throu Minecraft. And again, the most awesome things happens. We usually have 45 min classes, most of my students has problems with their concentration. Well, they sit at my classes till I tell them they have to go... So, I've succeed make math so fun they don't want to quit. In fact, I've succeed with this math mission so well the students ask me for more sessions - even if it's on their sparetime. As today. They also do something that I've never experienced before: they shake my hand and thanks for the class... some of them do it the gangsta style, but hey - they show what it means. And the gangsta way, that's respect. I create a model of my task at the same time. I can directly see if I've done something wrong in my calculations and change it. I can, whenever I want or need, control myself. Back a bit and reflect to my self: is this realistic? 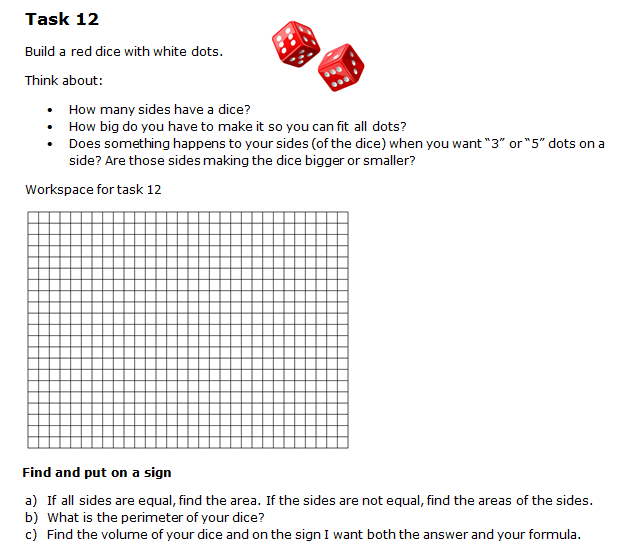 Later he actually proved this when I wanted him to do the task with the red dice with white spots. Because I showed him some different ways how to make that work, where the sides could be 5, 7 or 9 blocks. He made it with 10 blocks. He realized he had to build a bit more but it would be much easier to do the counting afterwards: perimeter, area and volume. I also did a personal reflection: he has started to make notes on paper and also started to make a sketch at his paper before he starts to build his tasks... And please remember, he doesn't like math. And now he's learning without thinking!